To make you a Competent Stargazer in ONE HOUR FLAT! YOUR StarPower ASTROLOGICAL GLOSSARY + FULL COURSE ON HOW TO BE A STARGAZER AND READ HOROSCOPES. See the 9pm clock point, horizon on left? That is the ascendant it sets the TONE for who it is if it's a natal, and what is going on at this noon hour. The 'chart reading' and LESSON I would do for you if you'd like to learn to read charts. would involve your reading today's stars. ASK ME FOR THAT URL NOW. By email to astrology at earthlink dot net. THAT URL CHANGES EVERY DAY. Today it's http://www.luckinlove.com/oct7.html but tomorrow it will be oct8.html and so on. I posted today's star reading with today's chart in cyberspace. DO IT EVERY SINGLE NIGHT for students to use. You use the DAILY STARS PAGE, THE RULES OF ASTROLOGY really stick to your brains. You learn how to read the chart above which THEN will have some meaning. The reason is it's a quick study is that you've already absorbed so much 'star stuff' in your lifetime that when you read this in PERFECT ORDER, it will be as if you KNEW IT ALREADY. Get your DAILY READING with a new chart done like scope above, every day. It has an hour by hour 'prediction' for all day and night. Tip the stargazer as you set up appointments for power days and dates for FABULOUS NIGHTS and feel the STARPOWER working for you, the success raining down on you. You HITTING THEM OUT OF THE PARK. While you're reading your HOUR LONG LESSON, memorize everything on this page. You can and will, fully, to an amazing degree. You, too, can make a moonlighting living doing readings, stargazers earn up to l00$ the hour. And often doing highly paid party entertaining work, 500$ a night, depending on city you're in. It's truly memorizing this which is the basis of being an astrologer or 'stargazer' as I like to call it. Then get a TAROT book and memorize THAT. Last get a PALMISTRY BOOK or read my quickie course. ( PALM READING SECRETS) When you begin to read charts, you'll LEARN from that, too. Each person's unique destiny or personality quirks always will look just like his chart, so do create people's charts over at ASTRO.COM and analyze it -- then you really get good! (CLICK on URL. Go there. See five lines of text at bottom of screen? Pick middle one "FREE HOROSCOPES" then big menu opens go to bottom right, click on EXTENDED CHART DRAWING. They ask you go fill in birth data, on a separate page, click to get a chart and right click to save it to cache. I. THE SIGNS ( learn the planet that rules the sign, too) You will want to draw a circle, divide it in 12 pie slices and start filling all these facts and the GLYPHS BELOW into appropriate 'slot' in your circle. When finished. HANG IT. ARIES- Rules self love, primal identity, the male energy, the do-er, builder, hunter warrior; leadership powers, head and teeth. (MARS is the ruler of ARIES). Draw a circle, divide into 12 pie slices and put this in the lst house. Over at the horizon, left side. On a clock, this would be between the 8 and 9 position. COLOR it RED. LIBRA- Partnership, marriage, beauty, romantic love, spine. (VENUS rules this sign) Colors are PINK,PALE BLUE, LAVENDAR, ABALONE IRRIDESCENT, rhinestone, romantic 'light' grays. CAPRICORN- Career, boss, father. Worldly power. Fame, knees. (SATURN) GRAY/charcoal steel. URANUS-Friends, wishes, humanitarian reform, ankles. (URANUS) PLAID/ MAGENTA WITH ULTRAMARINE BLUE AND WHITE, patterns, florid prints, Kandinsky or Missoni (designers) waves. Mental studies that change MIND habits. PISCES-The end of life, feet, nerves in entire body, Spiritual studies that change our vibration, Karma, the Astral Plane. The twelfth sign, rules those who are disincarnate helping you. (NEPTUNE) LAVENDAR. SUN- This is not a planet, but a luminary; it's the biggest quality or thing you have in your life, represents what you're known for, your reputation, your greatest talent. In a woman's chart it symbolizes the male side of her own identity, her fame, her career. It also symbolizes the type of husband she wants and father she had. In a man's chart, it is himself. It can be the male SON or sweetheart.Also it is the lord of any house you have where LEO SITS! That'd be one of the 12 houses. MOON- The Moon is also a luminary. It represents the woman in a man's life (his mother or wife.) In a woman's chart it can also be her mother, or the aunt, sister, friend. Your archetypal GAL PAL. In both sexes the Moon represents the inner YOU, your feelings, your psyche, the emotional type you are. How you tend to react. The house that moon rules is your closest female person. RISING SIGN- (ascendant). This represents your physical type, typical behavior, mood, front door of chart, it's also your home's front door, where you are usually found, how you operate. MORE importantly, it determines the single planet that is the RULER of the chart. RISING DEGREE refines it even further. Hindus call the RISING ASTERISM the entire area 'around' that rising degree, up as well as down. VENUS- The Goddess of love symbolizes what gives you pleasure. It can be art talent, social abilities, how you are when in love. It generally is the sweetheart or mate, but also rules the partner in business.It is what sweetens the life. MARS- This is the motor that animates you. A strong Mars gives you drive, energy, ambition, strong ego-identity, leadership gifts. It is the SELF ENERGY, the muscle you bring to your identity projection. MERCURY- Intelligence, the way you think, speak, write. It's also your SIBLINGS, and rules young people, children, students. It rules your books, studies. JUPITER- This is the planet of luck and shows where certain gain lies for you. It also rules learning, expansion, travel. THE TEACHER. The guru. In Sanksrit that word means, 'dispells darkness.' Rules Sagittarius.It rules LUCK. Your good karma comes thru sign, house, aspects your natal JUPITER MAKES. SATURN-This is the planet that shows where you HAVE A HARD TIME, where you need to grow to survive OR ELSE! AT BEST, it's the MISSION IN LIFE, the DEDICATION AND DISCIPLINE. If a person, it is THE FATHER or BOSS. Rules Capricorn, Father Time. FATE! The house Saturn rules is your severest critic. URANUS- Rules ideas or people that stimulate you intellectually, that illuminate you, and cause change in your life. THE FRIEND, the SCHOOL FORCE, or club you go to. Rules Aquarius. NEPTUNE- Ability to fake it, lie, make things disappear, fool people, con men, actors but also on highest level, the good use, the priest, soul doctor pastor, one who helps you have faith, believe, pray and who can legitimately create magic for you. Neptune RULES the astral plane, your friendly ghosts, passed on presences, your own Soul, selfless charity. Faith that lets you achieve eternal life, goodness, trust instead of rapacious selfism. Neptune is THE SPIRITUAL unseen GUIDE or angel and what he's trying to help you with. Also, CAN rule drink, drugs, the CHAOS around you that makes you a hopeless case. Rules sign Pisces. PLUTO- Temptation, sin, the will to prevail. Can indicate obsessions, compulsions, criminality. It rules doing 180's and self transforming, rebirth. Can wipe away the past. Can as easily makes us ruthless, tricky. Rules SEXUAL AFFAIRS, the quality of personal magnetism. Said to rule Scorpio. House it rules does all the above. CHIRON- This is an asteroid or 'planetoid' between Saturn and Uranus that has a 51 year orbit of earth. It represents the 'wounded healer' someone with empathy into those who might have their very problem. Said to rule VIRGO, already a healing sign. BACCHUS- Speculative planet. Fun & great wealth. The Good life. Said to RULE TAURUS. The Uberwealthy. MIDHEAVEN POINT or MC- The doorway to your mission in life. A mini description of what you want to do for the planet.Your mission, your goals. Part of Fortuna- An Arabian part, your special LUCK point. It's also who you link with and where. You'd need a book on calculating Arabian parts. SOLAR software does it, however quite costly stuff. NODES or ECLIPSE POINTS- The group connections you have. (Called Rahu Ketu in India). These are the invisible head and tail of the "dragon" which, (a space in skies not occupied but connected to dates of lunations,) it creates eclipses! They are about linking. When a planet links to them, that linking is easy. Networking connections. The SQUARE of any two planets gives conflict but growth. The thing challanges but is available. The TRINE makes things easy. It gives instant LUCK, success. Perfect, easy harmony. The OPPOSITION makes two forces link tightly as 'complements' but there is a challenge to incorporate these two, dissimilar qualities. Defusing the battle, balancing yourself and negotiation may be req'd. The SEMISQUARE shows something close that can be used. The SESQUIQUAD shows you have to go far, but can link with this and win. The CONJUNCTION gives great power, puts things RIGHT in your lap! Something is right on you. The SEXTILE gives ideas/opportunities that MAYBE you can achieve. It gives ease in getting information. But nothing's a shoo-in with a sextile. It's just an opp. THESE ASPECTS will perhaps LINK two planets or maybe three, and thusly give a new 'gestalt' quality. Sometimes 3 or 4 planets link for a very rare, unusual POWER, DESTINY and COMPLEX 'flavor'. Ho Chi Minh had 8 or 9 planets all linked. A man of history. USA used him during WWII as their leader, gave him guns, training. Then we left & he led NORTH VIETNAM against us. OSAMA, same deal. We used him, taught him, paid him. Then left the area. ALL PLANETS especially COMBINATIONS of two or three have a + and a - way of operating. ANY two planets can project a dark side. Rarely Jup/Ven or Merc or Moon/ Sun as they're neutral or positive. But add a malefic planet, they can have a dark side. Even TWO MALEFICS can have a good side. MAR/SAT is a hard worker. SUN/ SAT is aspect more presidents have than any other. Usually, abstinant people don’t have the negative spin to the paired planets' action. People whose auras are really screwed up, bodies ill, they get the minus activity. Can't get the positive. You tofu & salad eaters always get the positives. You know who you are. WHY YOU ARE UNFAMILIAR WITH SESQUIQUAD AND SEMISQUARE. Reason is: Many stargazers don't use them.. DELL HOROSCOPE mag DOES in its DAILY ASPECTERIAN, (last 5 pages of the mag.) The EBERTIN graduate stargazer does. Any planet in ZERO CARDINAL signs, like ZERO ARIES would be 45 degrees from 15 TAURUS on one side, 15 AQUARIUS on the other side. And across the circle 15 LEO and 15 SCORPIO are the sesquiquad to that ZERO ARIES pt. If planet is say, 22 degrees, SUBTRACT 15 degrees and jump backwards a sign. 22 minus 15 = 7 degrees of the SIGN BEHIND ARIES, PISCES, a mutable sign ergo 7 degrees of ALL mutable signs.You learn this quick, so don't be afraid of it. 15 and jump. 15 and jump. In Astrology, these are 12 sections, (called Houses) to everyone's natal horoscope, at the moment of birth or at the moment of any event. 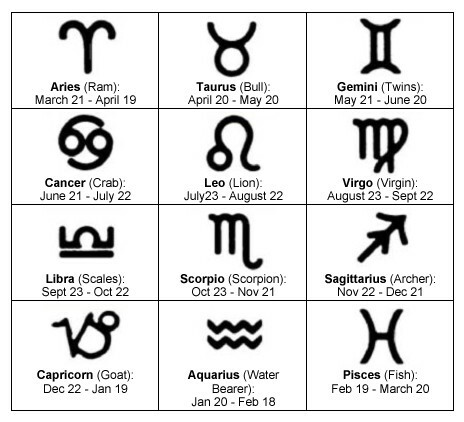 The Astrologer calculates them by determining what part of the zodiac was 'rising in the East' at the time of birth, thusly distributing the zodiac in the different Houses of not only a birth horoscope, but of any moment in any given day. The Zodiac is divided into 12 Signs which fall into 12 Houses, each House representing or ruling a different area of life. Go to astro.com and cast your own horoscope. Once you have your 'houses' start to think in terms of HOUSE RULERS. The ruler of the tenth describing by sign and hour your true destiny. Ruler of lst in terms of sign and house, describing your personal path. 1st House Self, environment, personality. What you project. 3rd House Siblings, early learning, mode of talking, communicating, things close by, the neighborhood. 4th House Family, roots, home, mother.The end of the matter. 5th House The loved one, child or sweetheart. Your form of Creativity/art. 6th house Job, pet, servant and your health.Matters that trouble you as they need organizing. As this is a troublesome house, any planet ruling it can be troublesome but especially a malefic planet. 7th House Mate, biz partner. THE OTHER PERSON. Grandparents, as this pair, lst and 7th happen to be the 4th and 10th of your parents. It can also be THE PUBLIC and also the open enemy. 8th House What transforms you, scares you into change. Partnership money, threat of death or trouble, taxes, debts. At best, TRANSFORMATION by shock principle. As this is a troublesome house like the 6th house, any planet ruling it is trouble but especially a malefic planet. 9th House Teachers, Gurus, higher education, travel. 10th House Career, boss, father. 11th House Your friend, club, your desires/wishes, aims. 12th House Karma you bring from past lives, conditions at the end of life, hospitals, death, enemies, unknown assailants.Threat of death. As this is a troublesome house, any planet ruling it can be troublesome but especially a malefic planet. If a good planet with good aspects rules the 12th, that is your guardian angel. A disincarnate helper. WATER- Emotions, feelings, the astral body. CANCER is maternal feelings, SCORPIO sexual feelings, obsessiveness, control of the other person, need for them, addition, PISCES - spiritual, selfless, sacrificial soul feelings. AIR- Rules the INTELLECT, and its DEVELOPMENT. GEMINI is early learning, brothers/sisters, speech. LIBRA is the love relationship with one's 'significant other' as well as the intellectual exchange with the mate. AQUARIUSis the friend, or special interest club, the political group as well a New Age intellectual systems, growth methodologies and therapies. EARTH- Rules your MATERIAL world. TAURUS is your money and your 'stuff,' VIRGO is your job, services you do to earn a paycheck, CAPRICORN is your true destiny or career. The l0th house is the CAPPIE house, and shows your mission in life. The promise you made God before you got here. FIRE- Your loves, passions. What lights you up. ARIES is love for one's self, basic identity. LEO rules love for one's child as well as romantic love, it also rules the passion for creativity. SAGITTARIUS is the love of the teacher for the student, and vice versa. It also rules the excitement of learning and travel. CARDINAL: Rajaistic or ACTIVE mode! These represent the major life arenas: ARIES is the SELF, and opposite it, LIBRA is the MATE or PARTNER. CANCER is our mother/HOME and opposite it, LIBRA is our mate/business partner. CAPRICORN is our father/boss/CAREER. CARDINAL signs are WHERE YOU HAVE your major ACTION! These are the four angles of the chart. Aries 1st house, cancer 4th house, Libra 7th house, Capricorn 10th house. Place them in the circle. MUTABLE- Sattvic or adaptable, CHANGEABLE mode. This is the background area of your life or it's things in fluctuation that you can change with your MENTAL ENERGY or which change on their own. GEMINI is early learning, grammar school, junior high, neighbors, classes, streets, trips, your ideas, writings, siblings who were your early learning. SAGITTARIUS represents your teachers & siblings of parents, siblings of grand parents, custodial relatives. VIRGO is job, pets, co-workers, agents, servants. PISCES is conditions in late life, KARMA. FIXED or Tamasic MODE, relate to conditions, people, things which pretty much stay the same. TAURUS money matters, our material station, financial class, LEO our children, beloved, sweethearts, our creative abilities; SCORPIO power given us, money from others, the sexual spell, sexual obsessions and mistresses, lovers. AQUARIUS desires, wishes, our friends. Fill this in, perhaps off your astro.com chart. Keep this sheet on reference so that each time you download your StarPower MAP OF THE MONTH you can refer to it. SUN (and here jot/note or state what it aspects, squares, sextiles trines, etc. Whatever. Write it down. The chart graphic has red lines for squares, blue for trines. EDIT/ CUT/ RESAVE and PRINT OUT & Use Part II as a note sheet for every horoscope you do. Questions? ask Anita at astrology at earthlink dot net. <===== BACK TO THE PORTAL TO ALL OF ANITA SANDS Hernandez 's 1,001 WEBSITES! Anita does readings for as low as 15$ by email. Send her your chart graphic. She's been doing this 63 years as she was 13 when her Mom taught her astrology and the palmistry books were in the house. Her mom didn't teach her that.